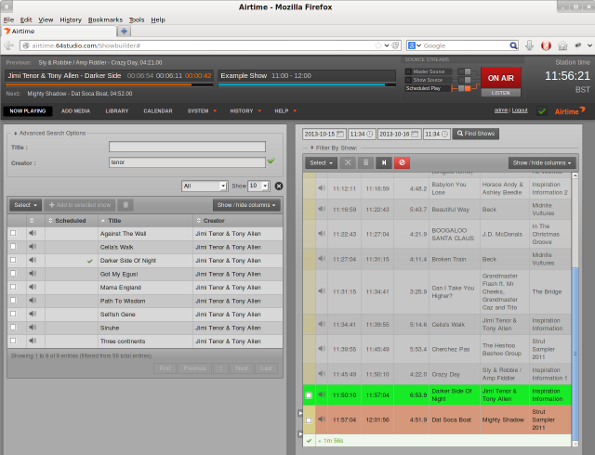 Airtime is the open broadcast software for scheduling and remote station management. Web browser access to the station's media library, multi-file upload and automatic metadata import features are coupled with a collaborative on-line scheduling calendar and playlist management. The scheduling calendar is managed through an easy-to-use interface and triggers playout with sub-second precision. Airtime has been intended to provide a solution for a wide range of broadcast projects, from community to public and commercial stations. Airtime supports the playout of lossy compressed audio files in both MP3 and AAC formats and the open, royalty-free equivalent Ogg Vorbis. It also supports playout of lossless FLAC and WAV format audio files. Available stream output formats include Ogg Vorbis, Ogg Opus, MP3, and AAC. The Airtime library is indexed in a database to enable searching. News editors, DJs and station controllers can use Airtime to build playlists or smart blocks and manage media files (upload, edit metadata, manage advertisements) at the station or via the Internet. The Airtime administration interface is designed to work with any web browser, on any desktop or mobile platform with a minimum display size of 1280x768 pixels. Airtime looks best on a high definition display of 1920x1080 pixels. The recommended web browsers are Mozilla Firefox 37 or Google Chrome 42 (or later versions). Apple Safari 6 (or later) is also supported. 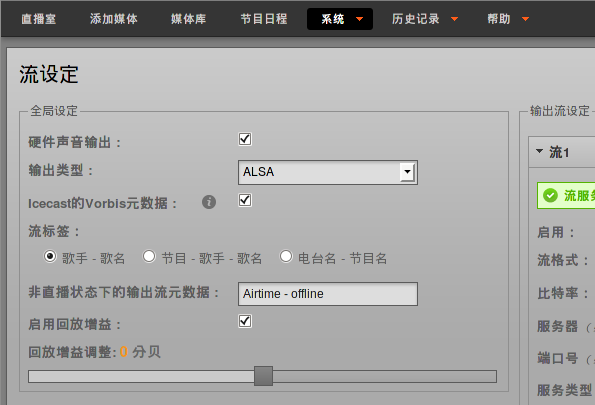 International UTF-8 metadata in media files is supported throughout, and the Airtime interface can be localized into any language or dialect. Localizations that are installed by default include Austrian, Brazilian, British, Canadian, Chinese, Czech, French, German, Greek, Hungarian, Italian, Korean, Polish, Russian, Spanish and USA. 1. There are media files on a storage server, which include metadata in their tags (title, creator, genre and so on). 2. The Airtime media-monitor keeps track of files being added, renamed, moved or removed from storage, and reads their metadata using the Mutagen library. 3. A PostgreSQL database contains the location of those media files and their metadata. The database also contains details of specified remote input streams. 4. Pypo, the Python Playout engine, downloads media from the storage up to 24 hours ahead of playout and checks it for average level (with ReplayGain tools) and leading or trailing silence (with Silan). At playout time, the media to be broadcast is sent to Liquidsoap. 5. Liquidsoap takes individual media files and remote input streams, and assembles them into a continuous output stream. This output stream can be sent to an Icecast streaming server for distribution over the Internet. You can stream to up to three different distribution servers with the same Airtime server, if you wish. 6. RabbitMQ pushes messages from Airtime to media-monitor and pypo about changes to media files and the playout schedule.